Last night I attended Auntie Leila’s “Crazy DC Meet-Up.” To those who are already familiar with her – How exciting is that?! To those who aren’t, “Auntie” Leila Lawler blogs, with her daughters, at Like Mother, Like Daughter. She provides practical and insightful advice on making a home, along with the family, parenting, marriage, and faith matters that go along with it. Anyway, the event was great. So great, in fact, that I hardly know where to start in writing about it – or even mentally processing it. Auntie Leila is so perceptive and thoughtful and good at putting her finger right on the truth of a matter. She has a real gift. She’s also very real and relatable, which – though I know I should have – I hadn’t really expected. I am responsible for cultivating the community of friends in which I want to raise my family. I need to remember that friendships are not static, that not all friends need to be your best friend, that I shouldn’t limit myself to making friends of my same age or family situation, that I can always use another friend, and that others can too. Not only should I always be reading something, and should some of what I read be challenging and instructive, but I should also arrange to be reading the same something as my friends every once in a while, so we have something to discuss when we’re together. Children (especially boys) need a lot – a lot – of time to run around uninhibited. Outside is best. So is getting incredibly dirty and sweaty and tired. Children also need to be taught to sit still (for a little while) and to obey their parents. So many things – making it quietly through mass, for instance – depend on the laying of that groundwork. They need to be taught to think of others – their parents, their siblings, their friends, and those they encounter only in passing. They need to be taught to be helpful. Boys need to be taught – especially by their fathers – how to channel their aggression. They need to be taught to stick up for themselves and to protect others – especially those who are weaker than they are. Now, I’m not going to pretend that all of this was new to me. As I told my husband last night, much of what Auntie Leila talked about, I felt like I already knew, if only intuitively. And yes, I learned lots of it from my own family. (Thanks, Mom!) But Auntie Leila articulated it so well – she presented it so clearly and sensibly, that hearing it from her not only reminded me of the lessons I learned from my own family, it refreshed and energized me. What qualities do I prize in people? What kind of men do I want my boys to grow into? What experiences do I want for my boys? When am I most happy and at peace? When am I most agitated or discouraged? What parts of my personality get in the way of me living the life I want to? What are the practical, everyday things I can do to help me be a better wife, parent, friend, and citizen? This morning I spent some quiet time with my boys, pondering it all. We built a castle out of blocks. We talked. I held my 21-month-old on my lap longer than I normally do. 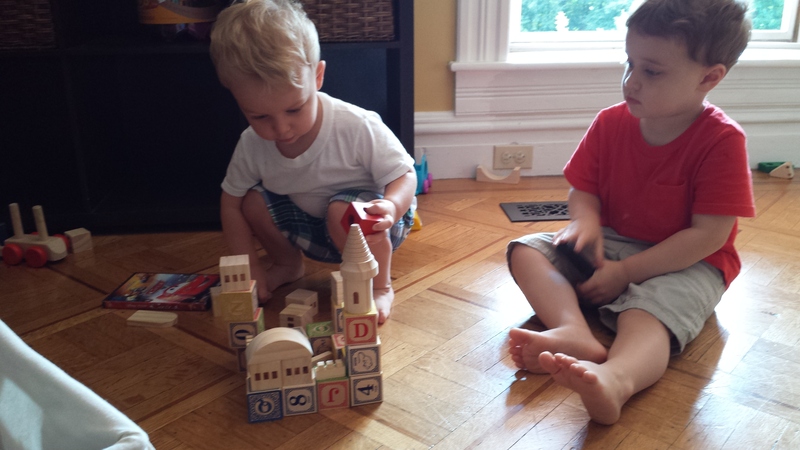 I witnessed my three-year-old’s delight as he stuffed blocks into his pockets. I gave and got lots of cuddles and kisses. We were still tired from a poor night’s sleep and my house is still a gigantic mess, but a cool breeze was blowing through the windows and my mind was filled with last night’s good conversation. I felt refreshed and hopeful. Thank you, Auntie Leila. P.S. I’m posting every day this week for Jen’s challenge. Check out others who are doing the same. P.P.S. Also be sure to read Jen’s recent post on “building a village” – it fit so well with Auntie Leila’s message. What a great opportunity. I would have loved to have attended. We left the Alexandria area last year, and I miss the community we had there. What parish do you belong to? Our old parish had the best mothers’ group. This sounds like it was a perfect night! She is so wise- I’m still working on my Leila-style meal plans…. It was great! She is so wise — but in a down-to-earth girlfriend kind of way. Which is the best way, as far as I’m concerned! Thank you! It was wonderful meeting you too! And — I’ve been enjoying looking through your blog! I loved both Auntie Leila’s post and Jen’s. Like you, so much of what Leila said rung true with what I knew intuitively (and much of which I got from my own wonderful mother), but it is so good to hear her express things with such clarity! I saw that you’re expecting two more boys! How exciting! If it’s any comfort (but maybe you don’t need any), my little guys, who are 15 months apart, are the best of friends. My absolute favorite part of parenthood is watching how much those two love each other. Even when they fight. My best to you! I, too, wish I had been able to meet-up. I love your recap of the evening. I’m sending the link to your wise words to my daughter. Thanks! Thank you for your kind words! I hope your daughter found it helpful. Thanks so much for your recap! How I wish that I lived closer so that I could have come. It sounds like you ladies had a wonderful time. It was great! I wish we could do more of such things! I loved reading all this… you make it sound so planned and reasonable 🙂 It was wonderful to meet you! God bless! Thank you! And thanks again for inviting us all to join you. It may not have been planned, but it sure was reasonable. Lovely meeting you, Deirdre, and Suki.